Secretary of State John Kerry will head to Capitol Hill this week to testify on negotiations to curb Iran's nuclear ambitions as some members of Congress push harder for new sanctions with the latest round of talks failing to produce an agreement. Kerry will meet with members of the Senate Banking Committee, a committee aide said. The session on Wednesday will be closed, a senior State Department official said. Western sanctions have hit Iran's economy, slashing crude oil exports and triggering inflation. Some of the restrictions originated in the Banking Committee. Senators from both parties have pushed for tougher sanctions to increase pressure on Iran even as the Geneva talks showed promise at last week. They broke up on Sunday with no deal, but negotiators plan to resume talks later this month. "We were very, very close, actually, extremely close. I think we were separated by four or five different formulations of a particular concept. But none so terribly that I don't think it's possible to reach be able to reach agreement," Kerry told the BBC in an interview, according to a State Department transcript on Monday. The United States and other world powers believe Iran is trying to build a nuclear bomb and want a deal that scales back uranium enrichment. Iran says its nuclear intentions are peaceful and wants sanctions relaxed. Banking Committee Chairman Tim Johnson of South Dakota won't decide until after Kerry's testimony whether to move forward with a proposal for additional sanctions, the committee aide said. "Chairman Johnson will not make a decision on additional sanctions until he has had a chance to consult with his colleagues following the briefing," the aide said in an e-mail. But Sen. Lindsey Graham told CNN's "State of the Union" program on Sunday that he would not wait for the next round of negotiations. A member of the Foreign Relations Committee, Graham said he intends to propose a measure that would mandate more sanctions, aimed at forcing Iran to dismantle its nuclear program – a move that runs counter to interim steps sought by negotiators in Geneva. Kerry also said on Monday that negotiations with Iran involving the United States, Germany, France, Britain, Russia, and China should not be rushed. "This is not a race to complete just any agreement. No deal is better than a bad deal, I have said many times, as has said President Obama. 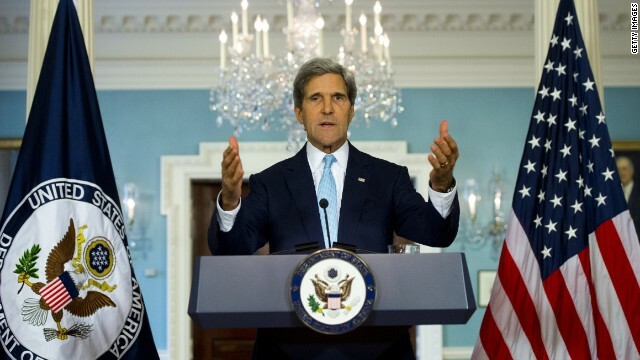 But through diplomacy we have an absolute responsibility to pursue and agreement," Kerry told reporters in Abu Dhabi. I said a while ago that the new Iranian president was only interested in playing politics. He is just a puppet of a much larger regime with its' own ideas and agendas. He is playing the moderate to excite Washington's desire to not only curb Iran's nuclear ambitions but to move beyond decades of diplomatic firewalls. The Iranians stand to to gain time and loosening of sanctions throughout the talks, which allows them to keep their Uranium enrichment ongoing and progressing. The only way the Iranian regime is successful in their ploy is if we allow ourselves to be fooled. I say the sanctions are what brought them to the table in the first place, even if it is just a ploy. Let's tighten the sanctions until the neck of this regime is red and the blood vessels bulging. If they don't cry uncle under that kind of pressure then it becomes obvious that we have but only two options left. The first is to either keep the pressure on until they collapse, or tighten the pressure even more to accelerate the collapse. The second is simply to conduct military strikes to destroy and disable the enrichment process and cripple the the enrichment capabilities. But which choice is chosen depends largely on how far their program has advanced when the time comes to make decisions. So the sooner we make up our minds the better outcome of said choice. Boy where are the good old days when Hidebeast was in charge and set back our foreign policy by decades. Here is a lib that will do anything to look good. Oh let us say, give Iran everything for nothing in exchange. Iran, the country that chants death to america religiously. No joke. The country that celebrates bad days for us , like holidays. The country that has been playing games with its nuclear program for 25 years who all of the sudden we are supposed to believe because although the chanting, flag burning, effigy burning , terrorist supporting iranians took down some anti american posters , because they we not ok'd before hand. By the time you guys stop acting like it is your first day they will have finished their work. They say in 1 month you can send inspectors. Only they should be finished, or finishing sometime next week at the latest. Not only will they have time to finish but to clean up. They would never use the weapon them selves so it would be handed off. You politicians are going to wreck this country before we can vote you out. If Nuclear bomb is not a priority to Iran then why is it difficult to accept the proposal by the UN and get what they want. Iran, you have to choose between ego and hunger. Does the world community want a new war in middle east yes or no? if no make a deal with Iran. If west is up to mood for a new war then dont make a deal thats it!. Something tells me it wont be like Iraq. I remember the war between Iran and iraq which lasted for a 8years Iran was not even close to self sufficient in anything. But today I see a Iran more self reliable and sufficient in all diffrent sectors specially millitry field. And they are the only middle east country which stable and united. Is not like Syria or egypt. I truelly believe world war 3 is looming. War with Iran is inevitable. I agree. Unfortunately, there are a lot of right-wing fanatics on Capitol Hill along with the Israelis who'd like nothing better than a war with Iran, especially those in Congress along with the war profiteers who stand to make a financial killing as always out of another one of these useless wars. Even sadder, most of the public believes all that right-wing manure that these right-wing politicians keep spewing about the Iranians!!! Why does Mr Kerry bother briefing the Congress. The only person they listen to is the President of the United States Congress: Mr. Netanyahu! USA should negotiate a Regime Change with the iranian Opposition. You can not trust Taliban terrorists in Teheran. Please Keyvan, if I were you I'd be ashamed to display my ignorance on this web page! If Iran's nuclear program is for peaceful purposes only, why can't they abandon the enrichment of uranium beyond what is needed for power plant generation and research which is around 3 to 5 % purity. They are at 20% purity now and says it's their inherent right to nuclear program...read: N-Bomb program. Can't the West read this, it's a given. Not to mention that most of the 20% enriched uranium has been converted to metal. This means that it cannot be fed into centrifuges for further enrichment. Fabius knows this. He just wants to appeal for Arabs to win weapons contracts. Time to turn on hear on Isreals 400 nuclear weapons.. and illegal settlements . "Kerry will meet with members of the Senate Banking Committee"
Because the Senate Banking Committee is responsible for economic sanctions. The other committee Sec. Kerry has to meet is the Foreign Relations. Go read it again. Why is he bothering? Why not just let Netanyahoo tell the Senate what to do- that's what is happening in reality is it not? What are you rambling about? Democracy? Gaza? Stay off the meds or at least only stick to the prescribed dose. Good posting, KEVIN. Only a mindless Tea Partier would disagree with you!!! Lets just sell them some bombs and shorten the drama to oh say half-life.